Our Chicago Food Machinery commercial blender is designed with a powerful, 3 HP (at peak) motor and stainless steel removable blades geared by a ball bearing. This unit is a true work horse. Due to its 3 HP (at peak) motor, it offers a nearly unmatched power to handle even the heaviest duty blending job. The 2 liter (approximately 8 1/2 cups) Polycarbonate Carafe has a lightweight, easy pour handle. The rubber lid stays in place. The Chicago Food Machinery blender is equipped to mix both hot and cold liquids. It is perfect for making soup, puree, pesto, salsa and dips. Many enjoy making protein shakes, mixed drinks, smoothies and more! It crushes ice, chews up pieces of fruit and tackles thick mixtures. It is a convenient, fun and easy-to-use blender that saves both time and money. The versatile functions and superior power make this blender ideal for restaurants, smoothie bars, cafes, hotels, caterers, bars, and even home food prep. 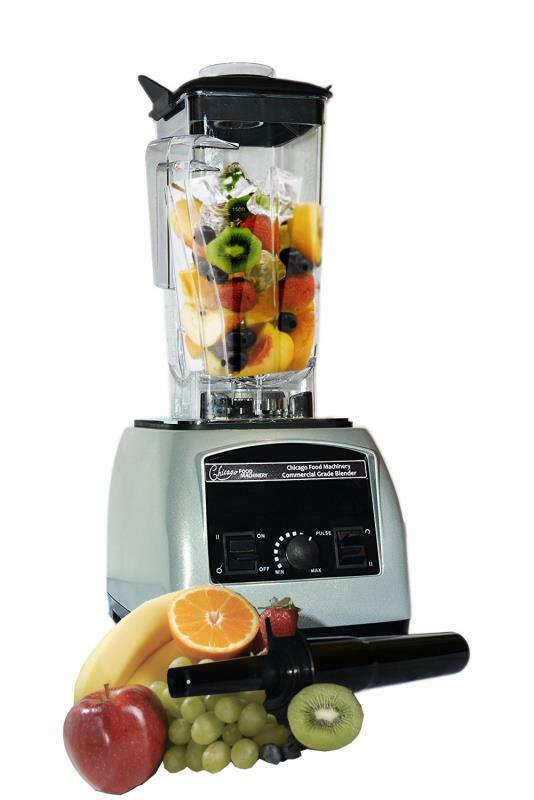 Get the job done and eat more nutritional foods when you use the Chicago Food Machinery commercial blender! Tamper - Eliminates air pockets from forming that prevent blending & its design prevents from touching the blades during blending. Dimensions: 8.3" x 9.1" x 20.5"
*Blenders are rated at peak because of the nature of blender usage; they typically only get turned on for a few seconds to a minute which it will be at peak during that time. They have a second run rating which is if it was turned it on and left it on for a long period - that is the HP it would run at.